The first train with 2 bogies started its service on 22-12-1851 and carried soil from Roorkey (Central India) to Piran Kaliyar for the purpose of construction of a canal. The first passenger train commenced its journey from Bombay VT (now renamed as Chatrapathi Shivaji Terminus (CSTM) on 16-4-1853 to Thane covering a distance of 34 kilometres. In due course, this line connected Mumbai and Delhi. Similarly, railway services were started between Delhi and Chennai. Gradually, the Madras railway line was extended upto Calicut and passenger trains started their services to cater to the needs of the people. During 1907, a bridge was constructed across the river Nethravathi for the purpose of rail connectivity and on 4-11-1907, the first steam engine with 6 compartments arrived to Mangalore. Slowly, the railway network was expanded to cover the country and depending upon the topography, trains were started on 3 gauges, viz., broad, metre and narrow. However, nobody succeeded in getting Mangalore connected to Mumbai inspite of having the privilege of Railway ministers from our State. Even after 30-35 years of Independence, our railway minsters could not link the thousand kilometres stretch from Mangalore to Mumbai. M/s. Yashodhara Dasappa, K.M Poonacha, Kengal Hanumanthayya, T A Pai and Jaffer Sheriff were the railway minsters from our state during this period. Around this time, Mr. Madhu Dandavate succeeded in getting the facility of train from his native place to Diva (sub-urban Mumbai). A passenger train with a few compartments was running one schedule per day. This benefitted many labourers from the rural side. 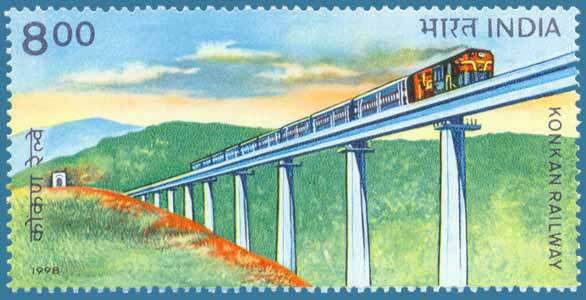 At the same time, Mr. Shreenivasa Mallya, the then Member of Parliament from Mangalore succeeded in getting a railway line for the purpose of movement of goods trains to the port at Panambur (suburban Mangalore). As a result of these efforts, a distance of 760 k.ms was still left outside the purview of the railway map on the West Coast. It was during the year 1988 that Mr. V.P Singh government came to power and Mr. George Fernandes (hailing from Mangalore) occupied the position of Railway Minister. One of the first tasks he undertook was to seek funds for establishing connectivity between Roha and Thokur through the budgetary process; however, he did not succeed. Not getting disappointed with this, he continued his efforts and won over the hearts of the Prime Minister who gave the green signal to establish an independent corporation as a result of which the Konkan Railway Corporation (KRCL) was born in the year 1990. Mr. E Shreedharan was appointed as the first Chairman, under whose stewardship the Corporation was permitted to raise funds from both within and outside India. To begin with, the Corporation had been established for a limited period of 10 years and was functioning as an autonomous body outside the bureaucratic regime of Indian Railways. Thanks to the efforts put in by one and all, the entire work was completed within a period of 7 years against the targeted time frame of 10 years. The first long distance train bearing no. 6346 between Kochi and Kurla (Nethravathi Express) started its maiden journey on 21-3-1998. The second train to run on this route was between Mangalore and Kurla ( Mathsyagandha Express) and began its journey on 15-5-1998. As of now, 9 daily, 15 weekly, 7 biweekly, 2 triweekly and 4 passenger trains are carrying thousands of commuters with their dreams to reach their destination as early as possible. The Yatri Sangha came into existence largely with the initiative of R L Dias, an ex-Serviceman, a former official of the department of forests and a public-spirited citizen. He has inspired a lot of like-minded citizens into taking up public causes. Article translation services were provided by Manipal University, Department of Commerce team.